Thanks to my friend and ProGen peer Shelley for passing the Ancestor Approved blog award baton from her blog, A Sense of Family, to Family Epic. And thanks to Leslie Ann of Ancestors Live Here who created the award early in 2010. I’m rendered speechless at the moment. And that wouldn’t necessarily be a bad thing except that I’m trying to maintain a story-telling blog. In the last two posts, I detailed what I have learned about the life of 2nd great grandfather Levin Dukes from his first known appearance in Baltimore records in 1847 until his death in Georgetown in 1866. But who are Levin’s parents and where was he born? His age of 39 in the 1850 census, and an 1866 death notice referring to him as being in his “54th year,” suggest a birth year range of 1810 to 1813. (3) At this point, I’m regarding the age of 40 listed in 1860 as one of those census anomalies; his age was probably provided by his twenty-four year old bride. (4) He’s not the first man to have aged only one year in a ten-year span! The surname Dukes appears most frequently in the counties of Caroline and Worcester, and to a lesser extent in Queen Anne’s County, all on the Eastern Shore of Maryland, and contiguous Sussex County in Delaware. The border between Delaware and Maryland is a fluid one; people readily moved back and forth. It’s complicated, though. There is not one Dukes household in any of those counties that has the right age and gender data match for Levin in 1820 to 1840. If his father died when he was young, his mother could have remarried and moved him into a household headed by stepfather. He may never have been enumerated in a Dukes household; he was born just after the 1810 count. In the aftermath of Levin’s death, no immediate family members stepped forward to take care of his children of his first marriage. That’s the corollary to my working hypothesis; he left the Eastern Shore as a young man to make his living and had few ties to his childhood home. I’ve consulted as many derivative and secondary, published sources as I could locate in Baltimore (but certainly not all that have been published) on the counties of Caroline, Worcester, Queen Anne’s and Sussex, without seeing a single reference to a Levin Dukes born 1810-1813. It’s time to delve more directly into original sources at the Maryland State Archives – land records, wills, estate files, guardianship papers, etc. Because there is a cluster of individuals named Levi (very similar name and one often indexed as Levin) and James (the name of his son) in Caroline County, that’s where I’m starting. You may not hear anything about this endeavor for some time! (1) 1850 U. S. Census, Baltimore (Independent ) City, Maryland, pop. sched., Ward 4, p. 69B (stamped), dwelling 821, family 962, Levin Dukes; digital images, Ancestry.com (http://www.ancestry.com : accessed 22 January 2010); citing National Archives microfilm publication M432, roll 282. 1860 U. S. Census, Washington, District of Columbia, pop. sched. Georgetown Ward 4, p. 162 (penned), dwelling 1034, family 1129, Levin Dukes; digital images, Ancestry.com (http://www.ancestry.com : accessed 24 January 2010); citing National Archives microfilm publication M653, roll 101. (2)1900 U. S. Census, Montgomery County, Maryland, pop. sched., 2nd District, Clarksburg, enumeration district (ED) 50, p. 20B, dwelling 375, family 387, Susin R. Henderson; digital images, Ancestry.com (http://www.ancestry.com : accessed 22 August 2010); citing NARA microfilm publication T623, roll 625. 1900 U. S. Census, Westmoreland County, Pennsylvania, pop. sched., Greensburg Ward 1, enumeration district (ED) 100, p. 30A, dwelling 574, family 625 [smudged], Sarah D. Offutt line 46; digital images, Ancestry.com (http://www.ancestry.com : accessed 22 August 2010); citing NARA microfilm publication T623, roll 1497. 1900 U. S. Census, Sussex County, Delaware, pop. sched., North West Fork Hundred, enumeration district (ED) 99, p. 10B, dwelling 193, family 194, Fannie A. Willey; digital images, Ancestry.com (http://www.ancestry.com : accessed 22 August 2010); citing NARA microfilm publication T623, roll 157. 1910 U. S. Census, Sussex County, Delaware, pop. sched., Representative District 2 (Greenwood), enumeration district (ED) 105, p. 3A, dwelling 52, family 57, Fannie Willey; digital images, Ancestry.com (http://www.ancestry.com : accessed 22 August 2010); citing NARA microfilm publication T625, roll 148. 1920 U. S. Census, Sussex County, Delaware, pop. sched., Greenwood Town, enumeration district (ED) 181, p. 1A, dwelling 11, family 11, Fannie Willey; digital images, Ancestry.com (http://www.ancestry.com : accessed 22 August 2010); citing NARA microfilm publication T625, roll 200. (3) 1850 U. S. Census, Baltimore (Independent ) City, Maryland, pop. sched., Ward 4, p. 69B (stamped), dwell. 821, fam. 962, Levin Dukes. “Died,” (Washington) Evening Star, 17 March 1866, p. 3, col. 2. (4) 1860 U. S. Census, Washington, District of Columbia, Georgetown, pop. sched. Ward 4, p. 162 (penned), dwell. 1034, fam. 1129, Levin Dukes. (5) A search of the 1840 federal census of the Dukes surname in Baltimore, using Ancestry.com, turned up one hit, a household headed by James Dukes, age 40-50, and including only one other male, age five to 10. (6) “Married,” The (Baltimore) Sun, 23 January 1847, p. 2, col. 4. Schell, Edwin. “Preacher’s Collection.” Card File. Lovely Lane Museum & Archives (Baltimore, Maryland). (7)Letter from M.A. 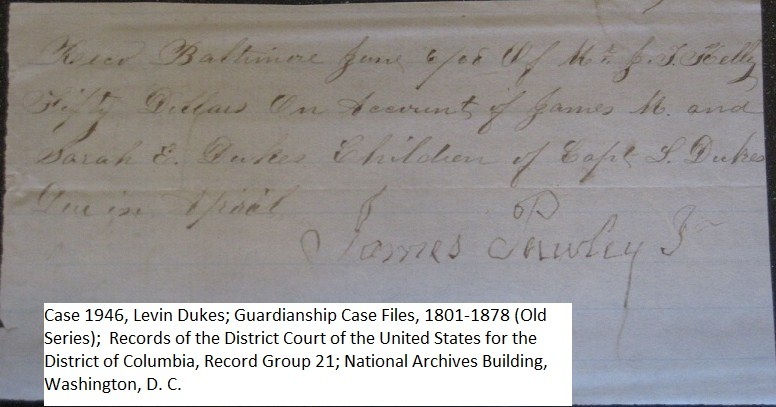 Dukes dated June 26, 1866, transcribed by Malissa Ruffner, 3 September 2009; Levin Dukes Guardianship Case 1832; Old Series Administration Case Files, 1801-1878; Record Group 21; National Archives Building, Washington, D. C.
(8) Baltimore City, Maryland, Register of Wills, Wills, Liber JHB 38: 214, James Pawley, Jr. (1872), Maryland State Archives CM 219-20, Annapolis, MD. (10) Lloyd Bockstruck and Karen Mauer Green, informal conversations with Malissa Ruffner, held 18 June 2010 at Samford University, Birmingham, Alabama, and 13 January 2011, at the Family History Library, Salt Lake Institute of Genealogy, Salt Lake City, Utah, respectively. (11) Pippenger, Wesley E., compiler., District of Columbia Marriage Licenses: Register 1, 1811-1858 ; Register 2, 1858-1870 (Westminster, MD: Famiiy Line, 1994), Register 2, p. 85. 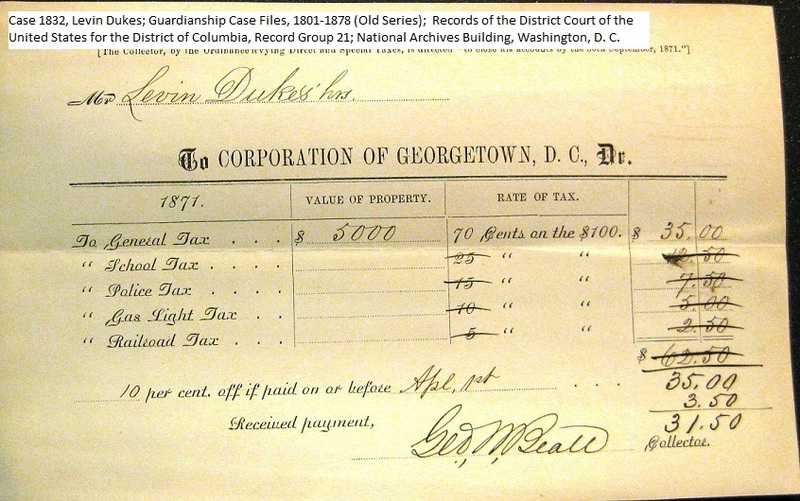 Let’s back up to the 1860 federal census and take a closer look at the years in Georgetown. Mr. Robbins advised me to draw up a letter stating to the court what I could afford to support the children with. My stepson is in his 19th year. I think I can board him for a hundred dollars a year, but shall expect him to clothe himself. My stepdaughters I will clothe, for a hundred dollars each, the oldest stays with me, the youngest with an Uncle in Baltimore. There will be no board for either of them. My own children (three of them) I should like a hundred each for them for board, clothing and everything. Our income (after the expenses in the house are paid) will be in the neighborhood of nine hundred dollars. I am not willing to spend more than the income. The three older siblings spent the next several years between Kelley’s new home in Darnestown, Montgomery County, and the home of James Pawley, the glass merchant in Baltimore with whom the family lived before relocating to Georgetown. Probate documents after 1866 do not mention Anna. She is most certainly the seven-month old infant buried with Levin. The Levin Dukes biography has a fairly clear and detailed ending, at least on paper. No doubt the back story of the personal relationships among his surviving family members and associates is a complicated one. I am indebted to Robert Ellis and George Briscoe, NARA archivists, for their assistance in navigating Record Group 21, and to Patricia O’Brien Shawker, for her NIGR lecture on NARA citations. (2) Pippenger, Wesley E., Dead People on the Move! : Reconstruction of the Georgetown Presbyterian Burying Ground, Holmead’s (Western) Burying, and Other Removals in the District of Columbia (Westminster, MD: Willow Bend Books, 2004), 134. (3) 1860 U. S. Census, Washington, District of Columbia, Georgetown Ward 4, p. 162 (penned), dwelling 1036, family 1132, John Lambie; digital images, Ancestry.com (http://www.ancestry.com : accessed 24 January 2010); citing National Archives microfilm publication M653, roll 101. 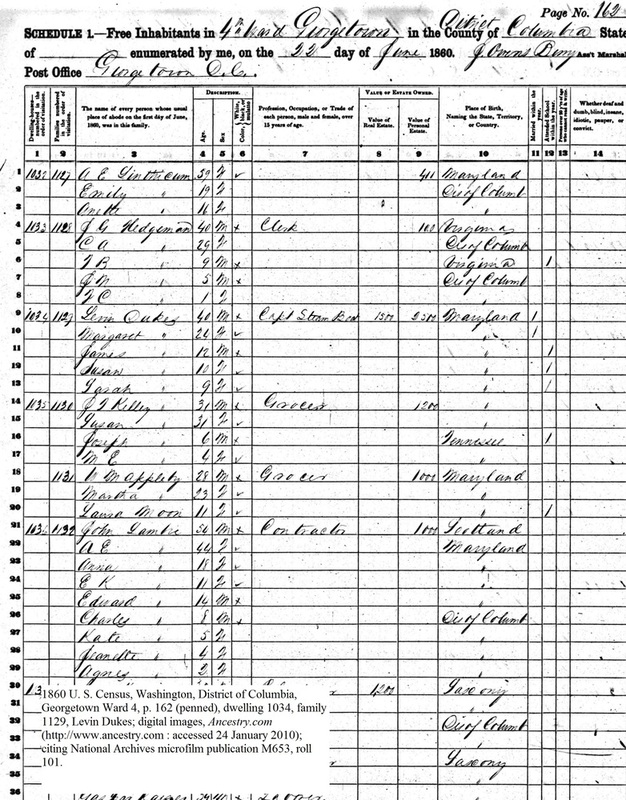 (4) 1860 U. S. Census, Washington, District of Columbia, Georgetown Ward 4, p. 162 (penned), dwelling 1035, family 1130 and 1131, John T. Kelley and W. M. Appleby; digital images, Ancestry.com (http://www.ancestry.com : accessed 24 January 2010); citing National Archives microfilm publication M653, roll 101. (5) Kelley, Joseph Crockett, Sr. and Alice McKnight Kelley. “My Grandfather Joseph Kelley,” p. 1; Kelley Family File, Vertical Files, Montgomery County Historical Society, Rockville, Maryland. (6) Margaret A. Dukes, Guardian Bond, 12 June 1866; Transcript of Guardian Bonds, Vol. 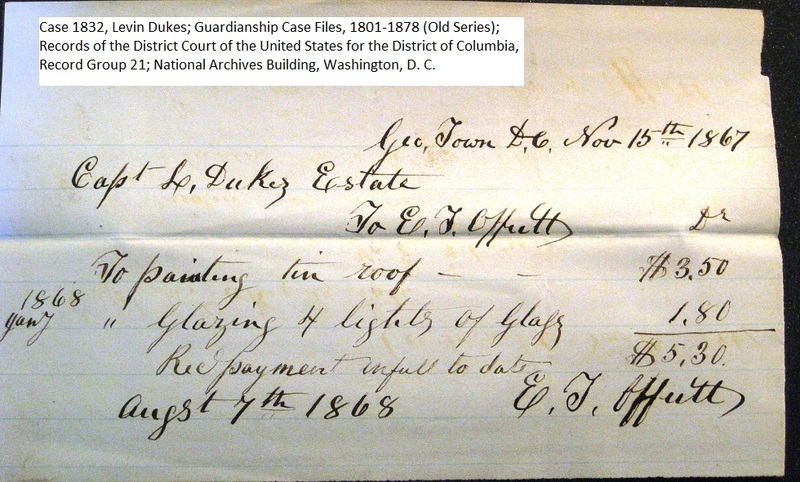 1, October 26, 1861-November 2, 1867, p. 398; Records of the United States District Court for the District of Columbia, Record Group 21 (RG 21); National Archives Building, Washington, D.C (NAB). (8) Entry for Tuesday, April 3, 1866, p. 262; Proceedings, Vol. 8, No. 8, E-109, March 25, 1865-July 23, 1867; RG 21; NAB. Margaret A. Dukes, Guardian Bond, 12 June 1866; Transcript of Guardian Bonds, Vol. 1, October 26, 1861-November 2, 1867, p. 398; RG 21; NAB. 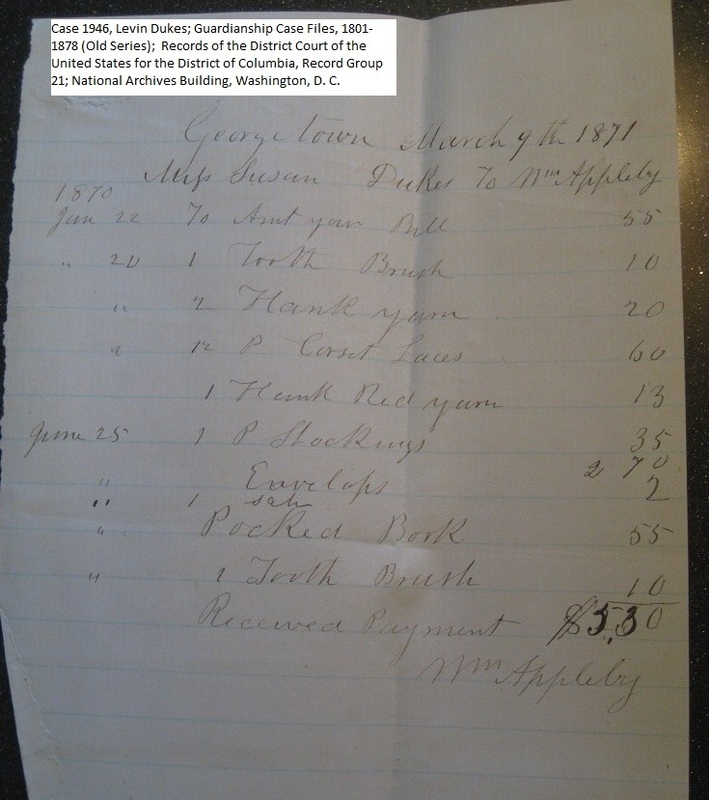 (11) Inventory of the Goods, Chattel and Personal Estate of Levin Dukes, transcription by Malissa Ruffner, 1 September 2009; Case 1832; Old Series Administration Case Files, 1801-1878; RG 21; NAB. (12) Appraisal of Real Estate of Levin Dukes; Case 1832, Levin Dukes; Guardianship Case Files, 1801-1878 (Old Series); RG 21; NAB. (13) Letter from M.A. Dukes dated June 26, 1866, transcribed by Malissa Ruffner, 3 September 2009; Case 1832; Old Series Administration Case Files, 1801-1878; RG 21; NAB. (14) Petition filed by John B. Davidson and John T. Kelley; Levin Dukes Probate, Case 5277; Old Series Administration Case Files, 1801-1878; RG 21; NAB. (15) Entry for Tuesday, October 9, 1866, p. 397; Proceedings, Vol. 8, No. 8, E-109, March 25, 1865-July 23, 1867; RG 21; NAB. (16) Entry for Saturday, October 24, 1866, p. 407; Proceedings, Vol. 8, No. 8, E-109, March 25, 1865-July 23, 1867; RG 21; NAB. (17) Entry for Tuesday, April 9, 1867, p. 517; Proceedings, Vol. 8, No. 8, E-109, March 25, 1865-July 23, 1867; RG 21; NAB. (18) Pippenger, Wesley E., compiler., District of Columbia Marriage Licenses: Register 1, 1811-1858 ; Register 2, 1858-1870 (Westminster, MD: Famiiy Line, 1994), Register 2, p. 85. (19) Entry for Tuesday, July 16, 1867, p. 587; Proceedings, Vol. 8, No. 8, E-109, March 25, 1865-July 23, 1867; RG 21; NAB. (21) Entry for Tuesday, August 20, 1867, p. 18; Proceedings, Vol. J. R. O’B No. 1, July 27, 1867-May 28, 1870; RG 21; NAB. (22) Appraisal of Real Estate of Levin Dukes; Case 1832, Levin Dukes; Guardianship Case Files, 1801-1878 (Old Series); RG 21; NAB. 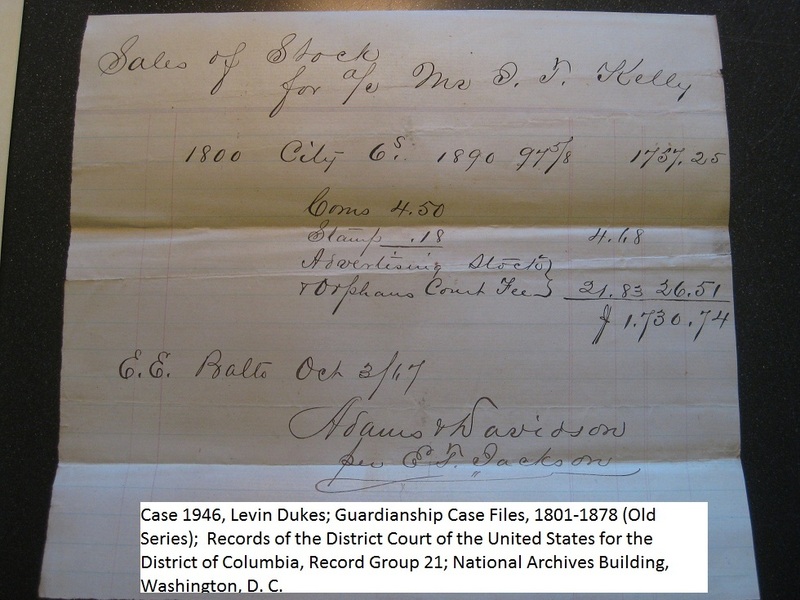 (23) Adams and Davidson Receipt; Case 1946, Levin Dukes; Guardianship Case Files, 1801-1878 (Old Series); RG 21; NAB. 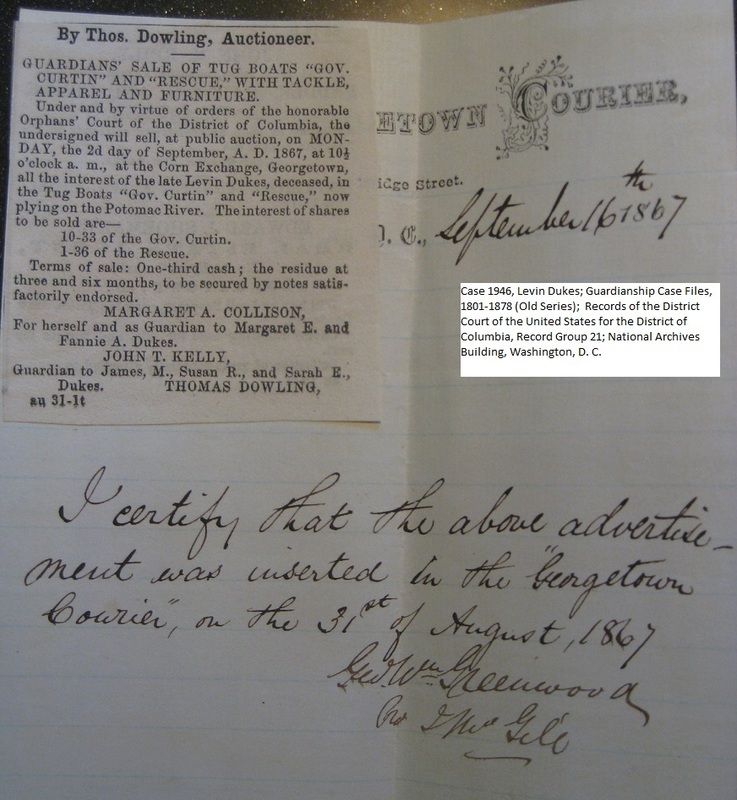 Dowling Auctioneers Receipt; Case 1832, Levin Dukes; Guardianship Case Files, 1801-1878 (Old Series); RG 21; NAB. (24) Items individually cited to either Case 1832 or Case 1946; Guardianship Case Files, 1801-1878 (Old Series); RG 21; NAB. Several lines ducked in and out of town at various times. But the most intriguing individual is Levin Dukes, tugboat captain, our 2nd great grandfather, who lived just north of Fell’s Point from 1847 (maybe earlier?) until about 1859. A Fell’s Point tugboat captain? It doesn’t get much more local than that. It was Levin’s daughter, Sarah, who married Lemuel Offutt, M.D., originally of Montgomery County, Maryland, in 1877, and moved to Pennsylvania, from whence we came. Dad told me in 2008 that his grandmother, Sarah Dukes, who died 16 years before he was born, was a complete blank to him. Two years later, we’ve at least made the acquaintance of Sarah’s parents, Levin and Susan (nee Tagret/Taggart), and know how their story ended. The beginning of their story remains elusive. The quest hasn’t reached “brick wall” status, the term genealogists use to describe their toughest research problems, but it has certainly been my biggest challenge to date. More on that in Part II or however many parts this is going to take. 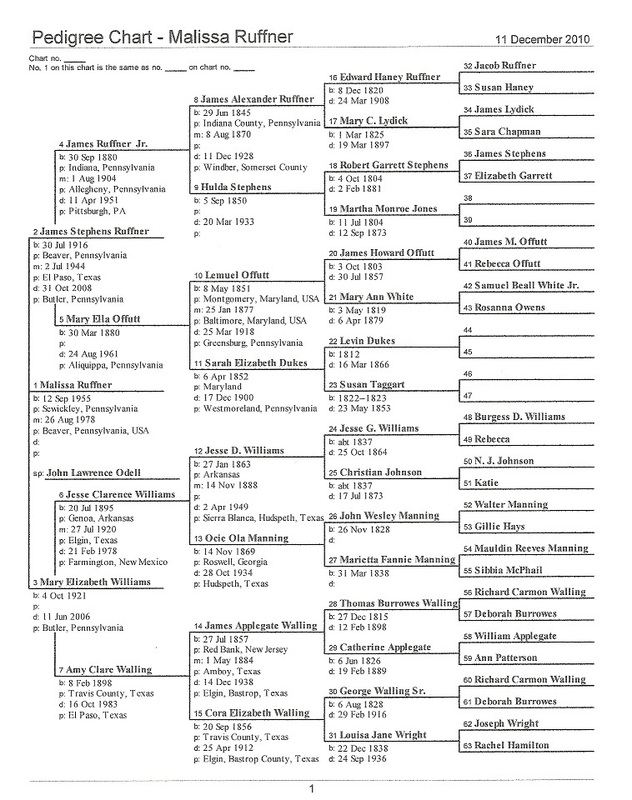 This pedigree chart (and by that, I don’t mean “high- falutin’ “) may make the posts easier to follow….. If anyone would like a copy of their own chart — as it stands now – let me know! This pedigree chart (and by that, I don’t mean “high- falutin’ “) may make the posts easier to follow….. If anyone would like a copy of their own chart — as it stands now – let me know!